The City of Lawrence Parks and Recreation Department’s Lawrence Rotary Arboretum that is maintained by local Rotarians and the Lawrence Parks and District Department has been awarded a Level I Accreditation by the ArbNet Arboretum Accreditation Program and the Morton Arboretum, for achieving particular standards of professional practices deemed important for arboreta and botanic gardens. The ArbNet accreditation program is the only global initiative to officially recognize arboreta at various levels of development, capacity, and professionalism. 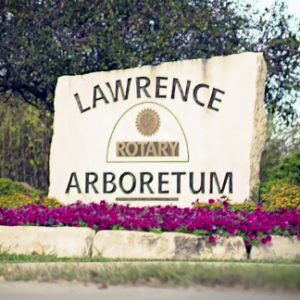 The Lawrence Rotary Arboretum is now recognized as an accredited arboretum in the Morton Register of Arboreta, a database of the world’s arboreta and gardens dedicated to woody plants. The Lawrence Rotary Arboretum was conceived in 2003 and dedicated in 2005 as a project by the three local Rotary Clubs in Lawrence, the Lawrence Rotary Club, the Jayhawk Breakfast Rotary Club and the Central Rotary Club as a fundraising activity to commemorate the centennial of Rotary International. Funds raised went toward the waterfront gazebo. The arboretum began development with the addition of new trees having identification markers which detailed the scientific name of the tree. Gardens were also added, including a certified Monarch Watch waystation, providing habitat for butterflies. Additional projects such as a performance stage, bike path rest station, and Westar Pergola were completed by local scout troops and other volunteer groups. Recently, an inventory of trees was developed through the department’s use of TreeWorks mapping software and using GIS to develop an interactive storyboard. The storyboard creates a self-guided tour of the arboretum, detailing trees planted within the arboretum with photos and common and scientific names of each species of trees via the internet. It can also be helpful to those visiting the park and can pull up the site on a mobile device. To visit the ESRI storyboard of the Lawrence Rotary Arboretum, please visit: http://lawks.us/2xCmOih. ArbNet is an interactive, collaborative, international community of arboreta. ArbNet facilitates the sharing of knowledge, experience, and other resources to help arboreta meet their instructional goals and works to raise professional standards through the ArbNet Arboretum Accreditation Program. The accreditation program is sponsored and coordinated by the Morton Arboretum, in cooperation with the American Public Gardens Association. and the Botanic Gardens Conservation International. The program offers four levels of accreditation, recognizing arboreta of various degrees of development, capacity, and professionalism. Standards include planning, governance, public access, programming and tree science, planting and conservation. You can find more information about ArbNet at www.arbnet.org. For more information, please contact Crystal Miles, horticulture, and forestry manager, at (785) 832-7970. During his year as District Governor, Adam Ehlert wants to encourage healthy clubs that are engaged and enthusiastic about “Making a Difference,” the Rotary International theme for 2017-2018. The motto “defines what we do day in and day out.” Such energy will attract additional members better than any membership drive, he believes. Ehlert’s “Rotary moment” struck during a Group Study Exchange that he led to Finland during 2011. His team bonded after an evening of “ice swimming”—repeated trips between a steamy sauna and a icy river nearby. The experience is the epitome of local culture. As the GSE team members huddled in comradery, wet and exhilarated, after several hours of the activity, the group spontaneously voiced heartfelt thanks to Rotary and to their hosts for the powerful impact of international exchange. The emotional situation committed Ehlert even more deeply to Rotary and its work and led him to his current leadership role. The 45 Rotary clubs of Rotary International’s District 5710 (Including Lawrence Central Rotary) have come together to support Heart to Heart International’s disaster relief efforts in Texas and Florida. Immediately after Hurricane Harvey devastated the gulf coast of Texas with over 51 inches of rain, followed by the damage caused in Florida by Hurricane Irma, Rotarians opened their hearts and checkbooks to help. Rotary clubs have been involved with the Lenexa-based Heart to Heart International (HHI) since its inception in 1992. Many of their founders and some of their board members are Rotarians so there is a natural connection and interest in supporting their mission. Initially, 5710’s District Governor Adam Ehlert asked that each of the 2400 Rotarians in the District give at least $5.00 which was matched with District funds. 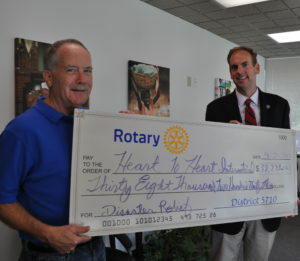 Ehlert said, “I am overwhelmed by the generosity of Rotarians in our District.” “To date, over $38,293 has been collected and an additional significant amount is given directly through the Heart to Heart’s website”. “Rotary International is the world’s most significant service organization, but we are not a relief agency. Heart to Heart is, and it’s our privilege to support them,” added Ehlert. Rotarians have also been involved in assembling and packing hygiene kits for distribution to those involved in both disasters. Nearly 30,000 kits have been distributed in the affected areas and the need continues. In Houston, HHI plans on providing medical care for the next two to three months until regular providers are able to reopen their own clinics. Some of the HHI medical volunteers are on their second tour following a short break at home. These services are provided at no cost to patients. Likewise, in Florida, HHI is the only organization providing emergency medical care to residents and responders in the area of Big Pine Key. 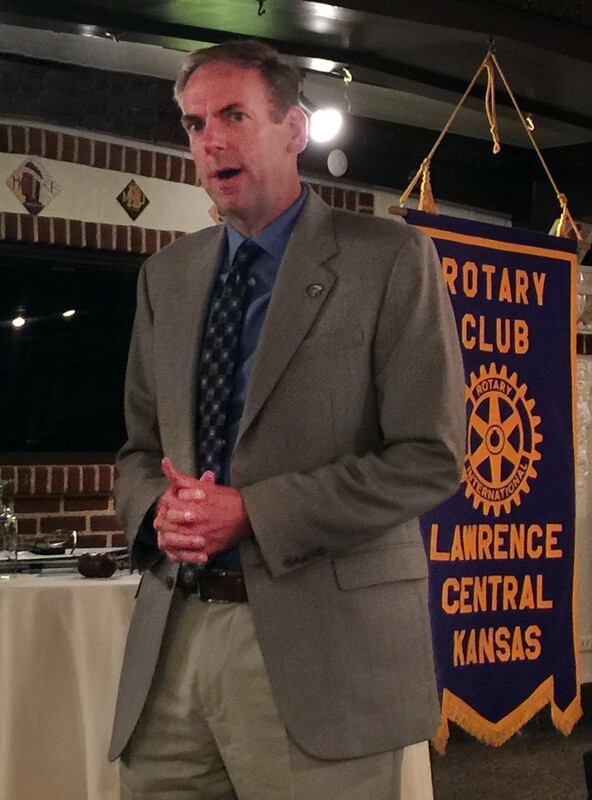 The District 5710 has 45 Clubs throughout Northeast Kansas, with some 2400 members. Rotary brings together a global network of volunteer leaders dedicated to tackling the world’s most pressing humanitarian challenges. Rotary connects 1.2 million members of more than 34,000 Rotary clubs in over 200 countries and geographical areas. Their work impacts people at both the local and international levels, from helping families in need in their own communities to working toward a polio-free world. Over two dozen eighth graders from Southwest Middle School told Lawrence Central Rotarians their ideas about how to make the world a better place. 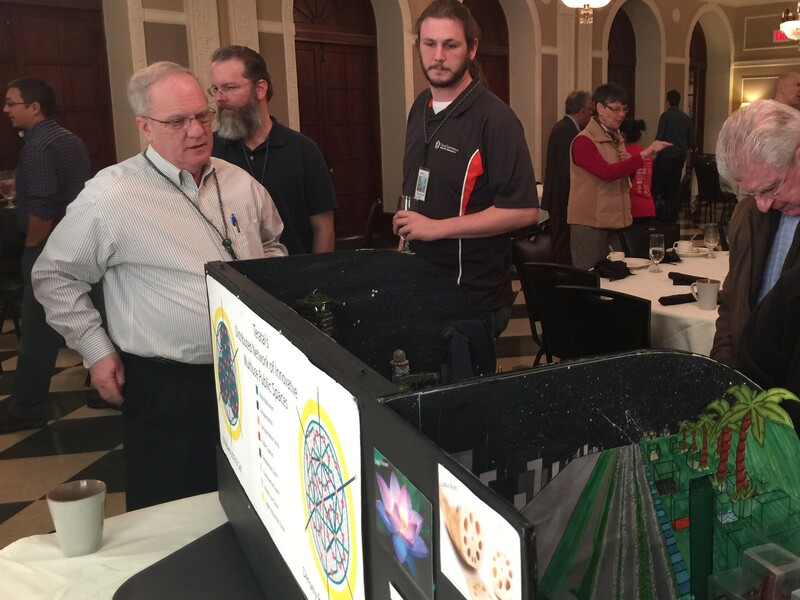 The students are all members of the Future City team that placed first in regional competition and then took home the fifth-place prize at the national Future City competition in Washington, D.C. In May, members of the team will give their presentation once again at the annual meeting of Underwriters Laboratories, a Future City sponsor. They are one of two teams who have been invited to attend the meeting. In the process of their work, the students learned and followed engineering methods: identify the problem; learn the specifications; brainstorm solutions; design it; build it; then test, improve, and re-design. 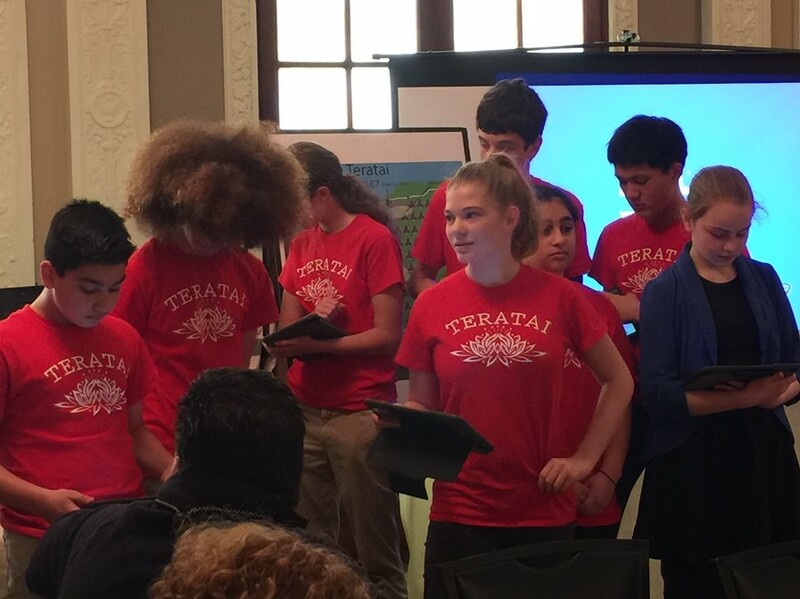 The program requires each team to develop a project plan, create the city virtually, compose a 300-word essay to describe their solution, build a working model out of recycled materials, and present their concept in a seven-minute talk. Co-coaches Danielle Lotton-Barker and Jamie Shaw guided the team in their work. When asked what they had learned from their experience, the students repeatedly exclaimed about the power of teamwork. They came together last fall as individuals with diverse talents, interests, and expertise, and they learned to work together to create not only a prize-winning product but also to develop respect for each other’s contributions and strong friendships. Several said that they intend to pursue careers in engineering and related professions because they enjoyed working on the project so much. The Burroughs Creek Trail in East Lawrence is a paved path and parkway running for 1.7 miles from 11th Street at the north end to 23rd Street on the south. The trail leads walkers, runners, and bikers past sites that were significant in Lawrence history, blending both health and history for all who travel its length. In a presentation to Lawrence Central Rotarians, Henry Fortunato explained the variety of historic places found along to the Burroughs Creek Trail. The path “ties together William Clarke Quantrill, and Langston Hughes, 19th-century travelers on the Oregon Trail and World War II-era German prisoners of war, the artistry of William S. Burroughs and the agricultural history of Douglas County, plus a long-forgotten railroad line and a number of dimly-remembered east side neighborhood notables whose names still grace streets and parks,” to quote the Lawrence Public Library website. 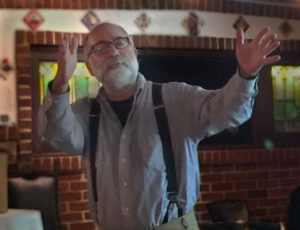 Fortunato, retired director of public affairs at the Kansas City Library and recent Simons Public Humanities Fellow at the Hall Center for the Humanities at the University of Kansas, made headlines in 2014 for walking 500 miles across Kansas. He said in interviews at the time that he wanted to “take the love for walking and exploring and create something everyone can enjoy.” He envisioned combining “all the things he’s learned in his professional career — public history, presentation, use of graduate students, humanities, and traveling exhibits — to enhance the walking and hiking trail experience in the greater Kansas City area by creating well designed interpretive panels” that tell about what happened along those trails. Happily, Lawrence has become the beneficiary of Fortunato’s vision. Fortunato’s comments referenced the traveling exhibit of ten panels that tell the stories of people, places, and events associated with the trail. The exhibit is currently hosted at Watkins Museum of History. By next spring, the panels of the traveling exhibit will be translated into interpretive signage along the Burroughs Creek Trail itself that will explain the points of interest and the history of area to people as they travel the length of the path.